Celebrity Cruises is set to transform the industry with the unveiling of The Celebrity Revolution, a $500-million reimagining of the fleet in partnership with more than 500 leading architects, designers, and engineers, all coming together to bring the rest of the brand’s award-winning fleet to the Edge. This involves redesigning the accommodations on board all the ships; introducing exclusive new sanctuaries for all Suite Class guests called The Retreat Sundeck and The Retreat Lounge and making luxurious upgrades to the restaurants, bars, and lounges. Alongside, new shopping experiences featuring sought-after brands and designers, such as Hublot will also be added, overall offering guests a leading-edge vacation experience. For redesigning the accommodations, Celebrity has collaborated with renowned international hospitality design firm Hirsch Bedner Associates (HBA). All staterooms will be designed with guest comfort in mind. The rooms will feature a fresh, chic design, rivalling the world’s best boutique hotels. They will also be fitted with Celebrity’s eXhale bedding comprising luxurious cashmere mattresses, RFID locks, pervasive Xcelerate and Bluetooth capabilities. 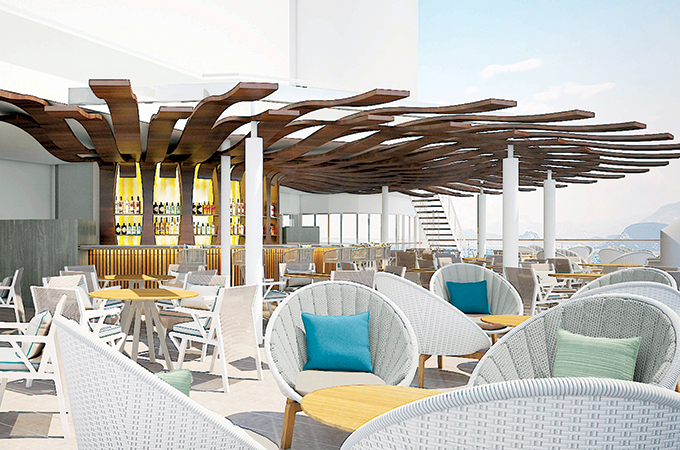 The Revolution began with the introduction of the new ship, Celebrity Edge, with an innovative outward-facing design that connects you to the sea and the destinations beyond like never before. It continued with the announcement of Celebrity Flora, the first ship designed specifically with the Galapagos Islands in mind. As well as Celebrity Apex, which will be taking the brand to the next level, offering guests the best way to experience the world in modern luxury. Guest-favourite restaurant Qsine will be added across the fleet and completely renovated, now offering the brand’s virtual Le Petit Chef experience, created by the world-famous artists of Skullmapping and presented by TableMation exclusively for Celebrity. The Oceanview Café will be redesigned, while the Main Restaurants will undergo a redesign, with new textures and new finishes added throughout. The spa experience on Celebrity will be enhanced further with the expansion of the new SEA Thermal Suite. The transformation is spearheaded by visionary designer Kelly Hoppen, MBE.